Swash characters are those with embellishments that extend off the standard character. 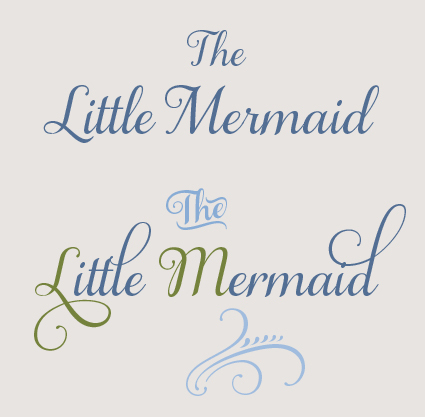 A swash character is usually – but not always – an alternate to the regular, unadorned default letterform. More and more typefaces are designed with swash characters, thanks to the expanded character capacity of OpenType® technology. The Samantha typeface has over a thousand swashes and alternates that can transform a simple, unadorned setting into one that is charming and distinctive. Swashes come in several varieties. They can be simple or intricate, subtle or dramatic. There are beginning and ending swashes, as well as swashes that can be used anywhere, including within a word. They are most widely designed for script, handwriting, and calligraphic typefaces, but are also available in some more traditional typefaces, including historical and period designs. The tasteful addition of swashes available in Wedding Singer™ gives an inviting, relaxed feel to this residential community logo. Swash characters are useful for enhancing and customizing many typographic applications, such as headlines and titles in articles and books, ads and catalogues, posters and brochures. They are also extremely effective when applied to logos, signage and packaging, which often benefit from a customized treatment. In text settings, swashes can also be used for initial letters, and chapter headings, as well as on announcements and invitations. 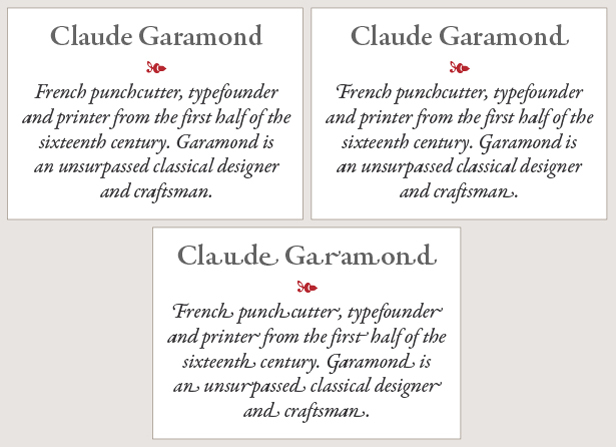 Garamond Premier™ is an historic typeface whose swashes can turn the standard, default setting (upper left) into one with a bit of panache and flair (upper right). In contrast, excessive and inappropriately placed swashes turn the setting into a poorly-spaced typographic jumble (lower). Certain swashes are intended for word beginnings or endings. Generally speaking, a swash designed for the beginning of a word will not flow properly in the middle or at the end, because of its size, spacing or ornate design. Choose swashes with their location in mind. Make sure swashes do not disrupt word spacing within a line of type. Save the more decorative forms for the beginning and ending of lines, sentences and titles. Setting swash characters in all caps is never a good idea. It’s too much of a good thing, and hard to read. Less is more when it comes to swash characters. A few go a long way. Readability should remain paramount. 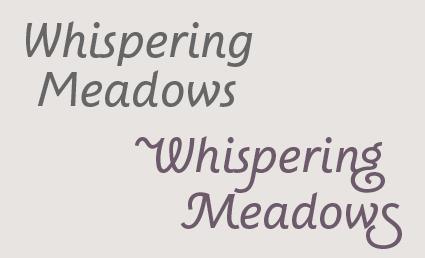 Swashes should not undermine or distract – they should enhance. Some OpenType fonts with numerous swash options for a given character are programmed to “decide” which might look best in combination with other characters, and will insert them as a default when the Swash option is selected in the OpenType panel. This feature, called glyph substitution, can be extremely helpful and timesaving. Note that it can always be overruled, either for a single character, or many characters. Setting all caps in swashes is to be avoided, as it tends to be both distracting and hard to read (upper). Instead, consider using a beginning swash form followed by standard caps, and a tasteful selection of lowercase swash characters, to achieve an attractive effect. Set in the Agmena™ typeface.